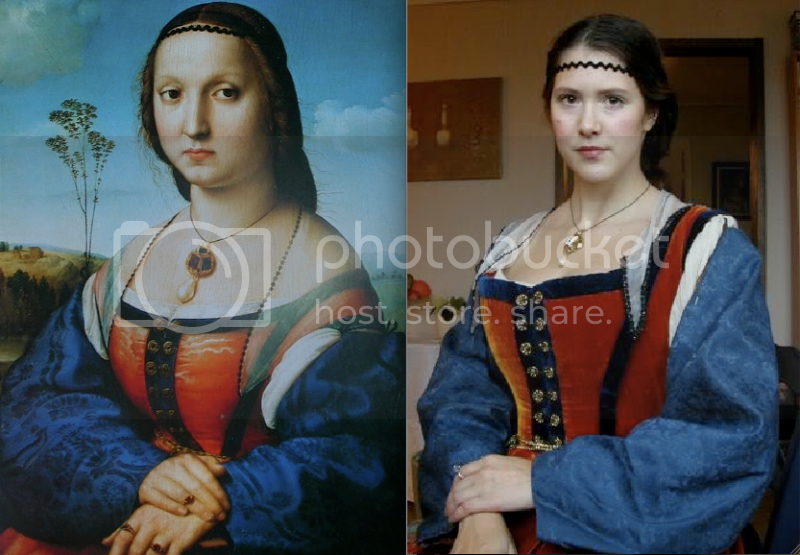 Florentine dress, based on Raphael's portrait of Maddalena Strozzi Doni (ca. 1506). 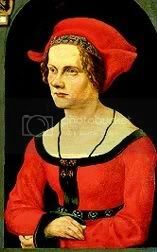 A dress in the Florentine high renaissance style, as depicted by Raphael. 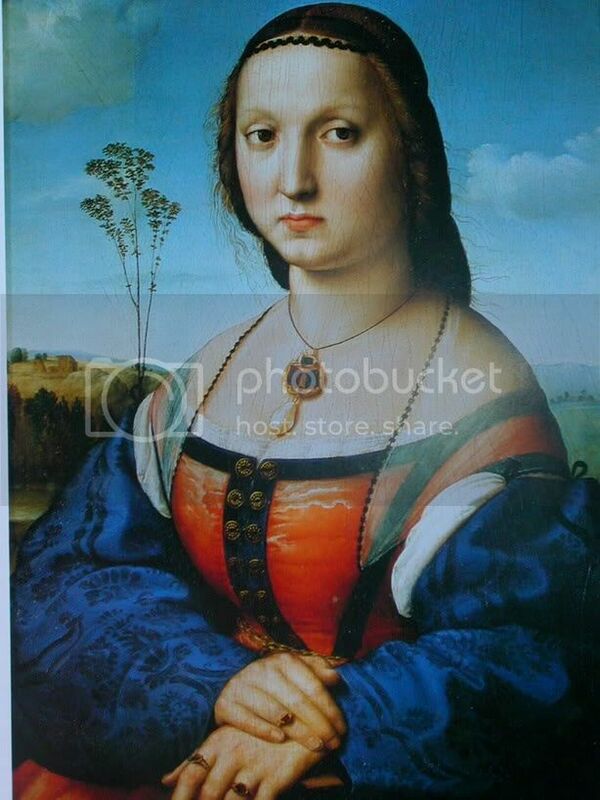 In particular his portrait of Maddalena Strozzi Doni, from ca. 1506. 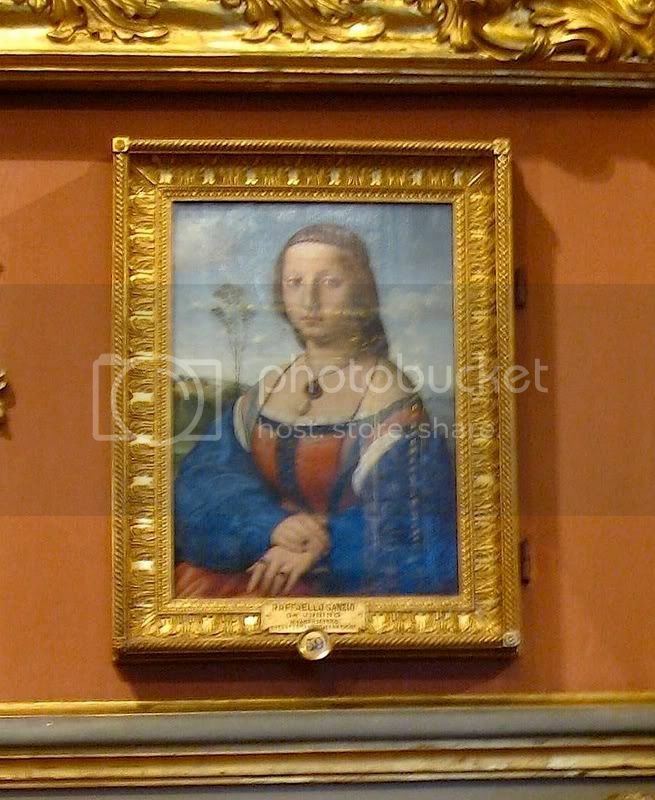 Her husband was a silk merchant, and he hired one of the top Florentine portraitists at the time - Raphael - to paint pendant portraits of him and his wife (today in Palazzo Pitti). 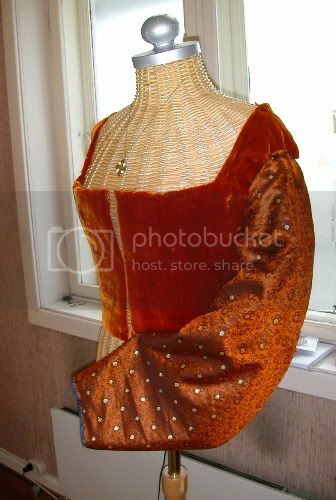 The striking orange silk and bright blue sleeves of Maddalena's attire really fascinated me the first time I saw it. But there was also something highly appealing about a dress in this style with front lacing. 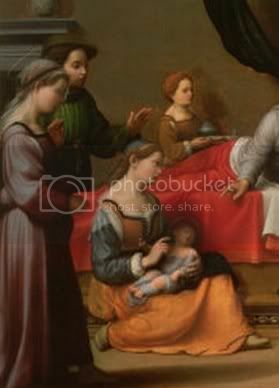 Apart from the aforementioned Raphael painting, I was also intrigued to see an almost identical dress in the contemporary painting Birth of St. John the Baptist by Giuliano Bugiardini (Stockholm Universitet Kunstsamling). This was a full-length view of the style, so it was of great help. 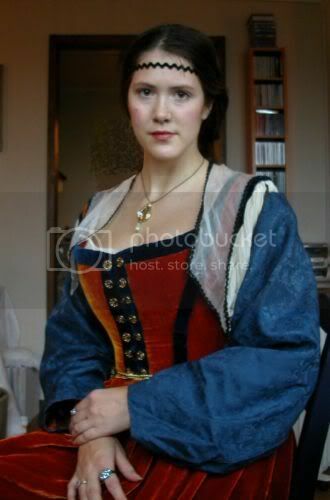 I was also highly inspired by Jennifer Thompson at Festive Attyre, and her Italian high renaissance styled dress. Turning to German and Flemish fashion of the time, I also think there's a certain similarity in the Maddalena Doni portrait and the one of Agnes Breu by Jorg Breu the Elder (painted between 1501 and 1506 sometime). Renaissance painters turned towards the North for their innovative style of portraits. The turned pose of the sitter, and the minute details in clothes and jewellery, as was especially typical for Flemish portraits, is something the Florentines adopted in the late 1400', abandoning the traditional profile portraits. The Doni dress is somewhat echoed by the lines in the Breu portrait, in the rounded neckline and the use of trims and metal decorations in front. 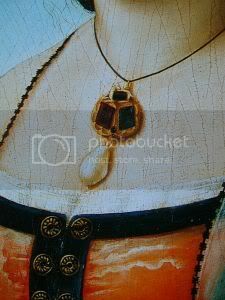 The outlines of the Doni partlet also echoes the jewellery cord of the Breu portrait. It's impossible to say whether this is coincidental or not, but I found it interesting anyhow - especially since they were painted in the same decade. 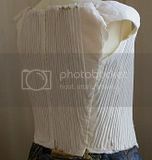 The overall bodice is simple in construction - two rather square pieces for the back bodice, two rather square pieces for the side/front bodice. The bodice is laced up in front. The fundament is of two layers of unbleached cotton, with orange viscose velvet on top. I decided to try out the hemp cord technique of Jennifer Thompson. I highly recommend the hemp cord technique: it's more comfortable than any other boning I've tried out. And in some ways it's easier - you don't have to tape the ends, like metal and rigilene boning. It gives high Renaissance just the right look. It curves where it ought to curve, but at the same time it allows the fabric to appear smooth and supported. I did use a slightly too thick cord for this project, so the bodice is a little heavy. When I tried the method again, in the Unicorn dress, I used a slightly thinner hemp cord, which worked even better. 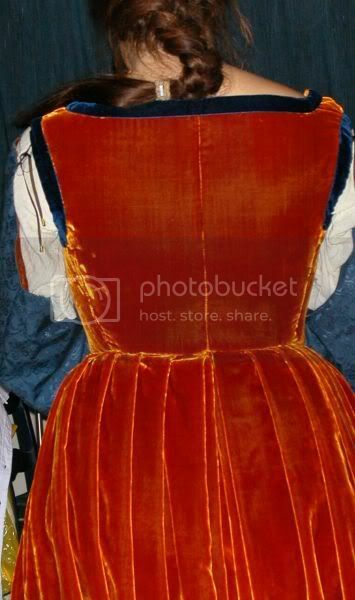 The bodice was trimmed with navy velvet trims. The front got lacing holes through all the layers, sewn by hand. The eyelets in front was probably the hardest thing to recreate in this dress. They are ornamental and wide, and IS half of the dress as far as I've concerned. I searched high and low for something that looked similar, but to no avail. Not when it came to eyelets, anyway. But buttons! 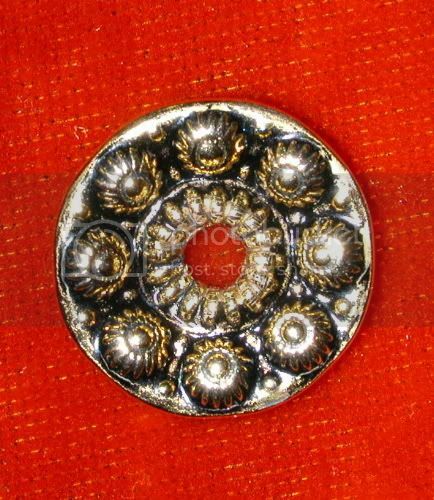 In a random fabric shop I came across some lovely "brass" buttons which, with some moderations, would be excellent for the purpose. I removed the backside, gently squeezed them flat and used a special tool to pierce the middle of them. First time I wore the dress the "eyelets" were so sharp on the edges that it kept cutting the lacing cord (...thank God for chemises...), so I had to polish the rough sides a bit. Now they work well. Historically the eyelets would BE the actual lacing hole instead of just hovering above them. But as far as looks go, they're ideal. 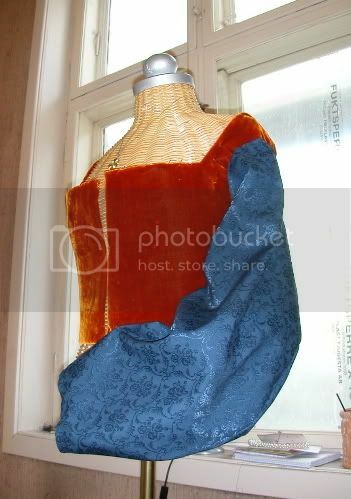 The skirt is made of a straight rectangle; 3,5 meters of viscose velvet. It was pleated in place, not having any seams or gores. Historically fabrics were often narrower and used in lengths, but as far as construction goes it was custom at this point to not add gores to the skirts but instead use straight panels. So no seams is a short cut, but no gores is historically accurate. 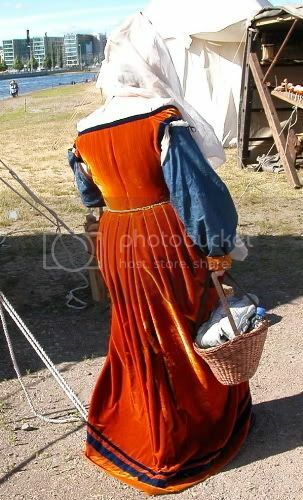 The gored skirts were introduced around 1540-50. 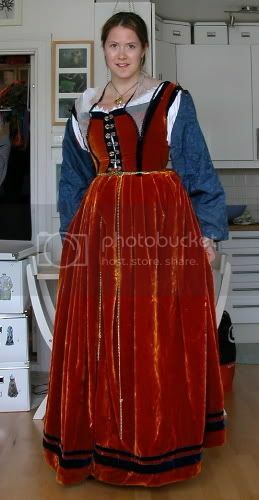 I added an extra strip of fabric at the hem, to make the skirt long enough, and the seam was covered by a navy velvet trim matching that of the bodice. An additional navy trim, a narrower strip, was added a bit higher. These trims were a nightmare to attach - velvet on velvet. No matter how much I kept pinning and stitching them in place they kept moving. In the end I had to do the whole thing by hand. The pleatings of the Maddalena gown is barely visible, so I really can't tell what is used there. 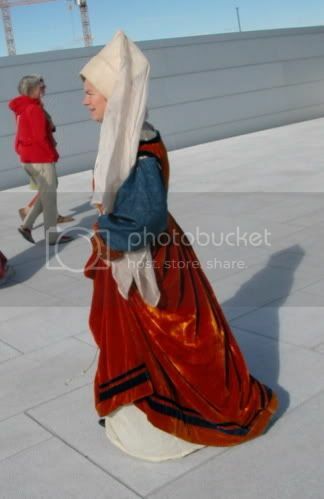 It's probably not cartridge pleats, since few early Renaissance dresses seems to have used it. I suspect box pleats might be right, but I wanted to try out knife pleats for once. The Unicorn portrait displays a neat knife pleated skirt, and I've tried to recreate those. It is a rather valid choice for this style of dress, at least. The Unicorn dress shows all pleats going in the same direction. But since the Maddalena Doni one is front laced, I chose to let the pleats turn "away" from the bodice on each side in front, meeting in a double pleat in the back. I like the effect. 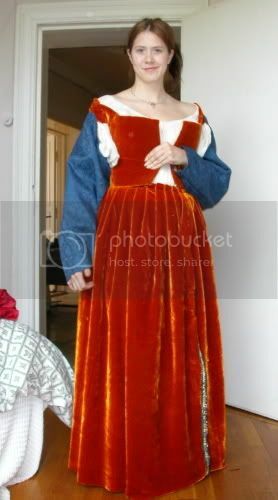 The sleeves were also inspired by Jennifer Thompson's dress at Festive Attyre, and they offers the right shape and look. They are round sleeves made of one piece, being almost as curved in the sides as in top. I chose to make them reversible, with a blue cotton/viscose damask on one side, and orange silk with a brown/golden pattern on the other side. The latter is very lush. 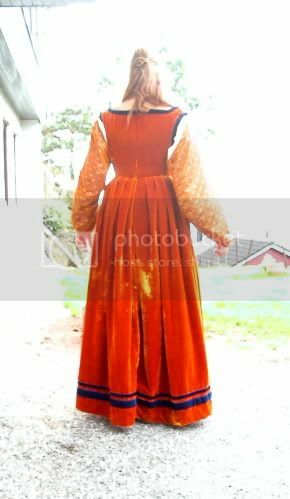 The sleeves are tied to the bodice by two brown strings with golden "aglets" in the bottom. 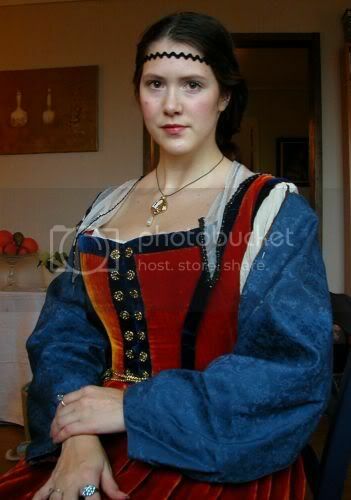 For this dress I use a plain brass metal chain as girdle, as seen in the portrait - though hers is without doubt of gold. 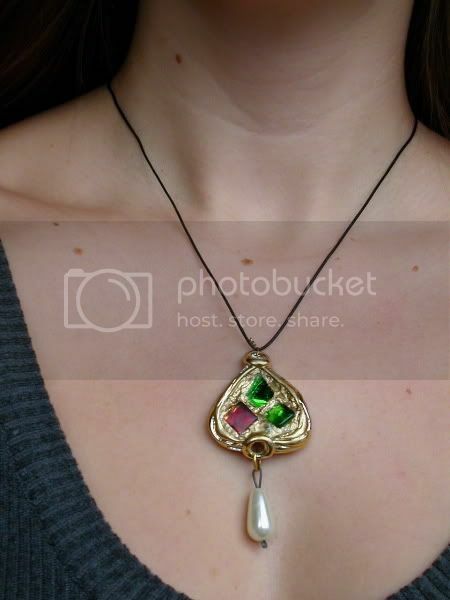 I also made a pendant with green and red stones, attached to a leather cord, also seen in the portrait. I tried to make a thin silk partlet with black trimmings, but it turned out too narrow in front, and won't stay in place when I move. Guess I have to make a new one eventually.